KUNDA DIXIT believes there needs to be a paradigm shift in journalism training from war correspondent to peace correspondent. The Nepali Times editor and investigative journalist is keynote speaker for the Media, Investigative Journalism and Technology conference at AUT University next weekend and his Frames of War photojournalism exhibition is also being shown. Don't miss out - register today! Images of Nepal’s civil war going on show in New Zealand next weekend illustrate the aftermath of war in a way words cannot. 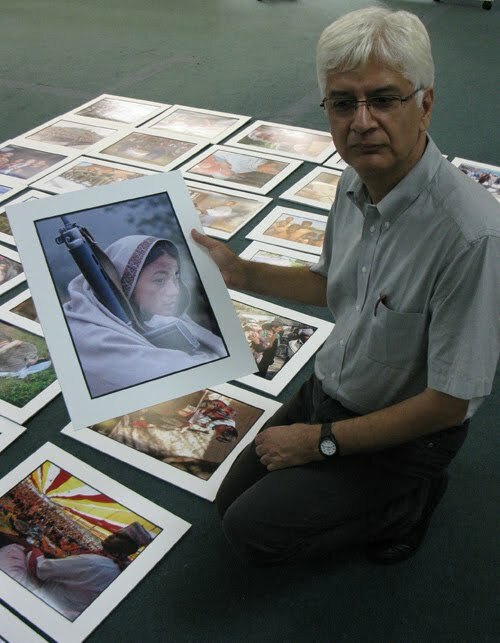 Kunda Dixit, Nepali Times editor and coordinator of the Frames of War exhibit, which will be opened at AUT University on December 4, says a picture does not tell a thousand words – it shows them. 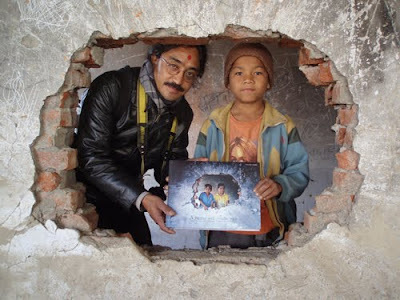 “Because of Nepal’s low literacy rate, the picture is the only way to communicate,” he says. The Frames of War exhibition contains pictures of the Nepali people during and after the 10-year-long People’s War, which ended in 2006. Dixit and his team – including noted Bangladeshi photographer Shahidul Alam and war photographer Shyam Tekwani – looked at more than 3000 images and chose 179 for their exhibition and their book trilogy called The People War. The exhibition and books do not have pictures of actual battles, partly because most of them took place at night. Dixit believes war journalism is not supposed to be about pictures of battles, it should be about how war affects ordinary people. The collaboration attempts to make up for the gap in media coverage of the Nepal war by taking the role of a “peace correspondent”, trying to focus on the human cost, the effect on civilians, the women and children. “In all modern wars, they are the ones who are affected the most,” says Dixit. Dixit thinks there needs to be a paradigm shift in journalism training from war correspondent to peace correspondent. “Reporters who go to war are almost celebrities. They cover the war as a series of battles, they count the body bags and chronicle the carnage,” says Dixit. “War correspondents focus on the battle plans, the strategy of the warring sides, and the hardwares of killing. Dixit suggests studying the roots of violence to discover the definition of peace and that journalists should be taught non-violence through leaders like Mahatma Gandhi, Nelson Mandela and Aung San Suu Kyi. “Violence is not just war; there is violence in our speech, violence against nature, violence in the home. You don’t have to be physically violent to be violent. Peace is not automatic, one has to fight for it, struggle to nurture it. The image Dixit finds the most powerful in the exhibit is of a young woman hugging the body of her policeman husband surrounded by the bodies of his colleagues. “There are many that are so dramatic that they still make me emotional to look at them,” says Dixit. When Frames of War was first shown to the Nepali people, the war had only been over for a little more than a year. Dixit felt the images may incite anger or renew old pain but instead witnessed a lack of revenge. “Even among the combatants there wasn’t much residual feeling of “enmity”. 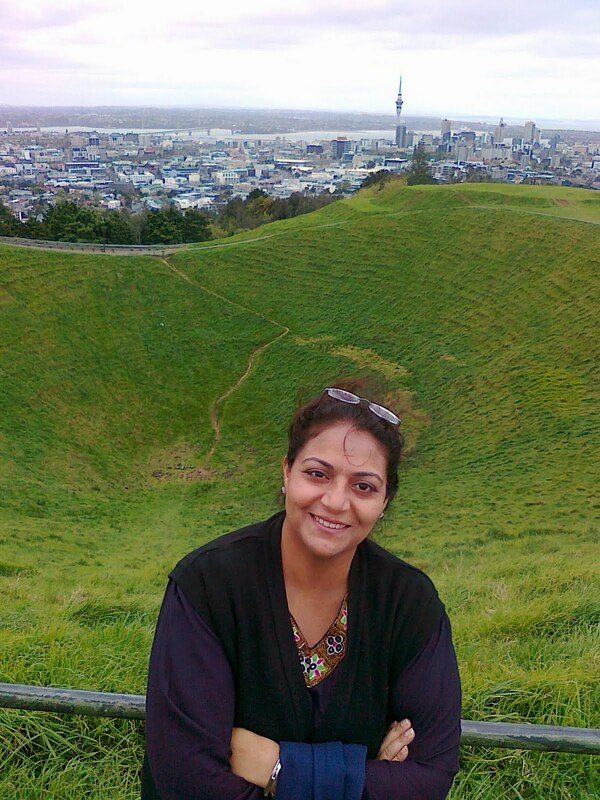 Dixit is the 2010 Asian Journalism Fellow, sponsored by the Asia New Zealand Foundation, and is a keynote speaker at the Pacific Media Centre’s first Media, Investigative Journalism and Technology Conference which will be held at AUT University on December 4-5. The Frames of War exhibition, showing some 45 images out of the original selection, will open to the public at 6pm on December 4 at WT005 on the ground floor of the AUT Tower Building, Auckland City campus. It will run for a week. HIGHLIGHTS at the dynamic JEAA conference at the University of Technology, Sydney, conference this week included ABC managing director Mark Scott speaking on the changing nature of news, tweeting the news and what the future holds for journalism. It was a digital optimist's view. Another optimistic view came from Sophie Black from Crikey in a following industry plenary. While many of the industry training heavyweights gave "boring" overviews out-of-touch with the critical challenges facing global journalism, Black said having an online presence w as essential for journalism graduates. 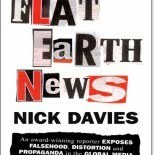 Nick Davies, author of Flat Earth News, and Ginny Dougary were audio-linked from the UK to JEAA2010 for 90 minutes of wit, humour and insight into where journalism practice is heading. The quality of our output as journalists has declined largely as a result of commercialisation- the interaction between journalism and commerce- and the impact of the internet on the relationship between journalists and the public sphere, says Davies. Advertisers are moving away from mass-media but the problem with the mass-media on the internet is that people won’t pay to read general news if they can get the story for free. 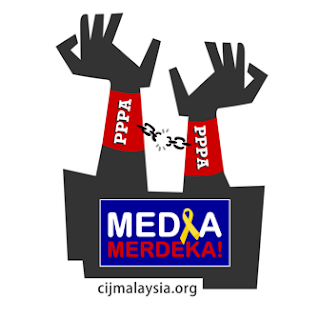 But the public will pay for information that they do not have access to otherwise [Read on]. SOME words of wisdom from a Reuters editor well worth sharing:"The old one-way relationship between editor and audience has no place in the world any more. 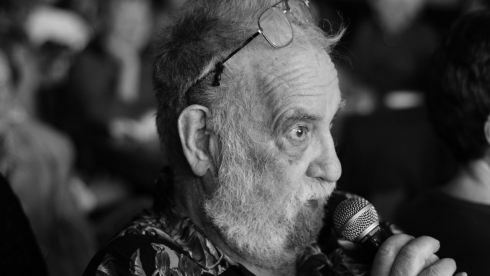 There’s huge learning to be had from the audience." Think back a century and news needs and news methods were completely different. Just think that the first airmail flight between Britain and Hong Kong did not land until 1936. And yet today at my home in London I get a rich and vibrant stream of news, photographs, stories and gossip from Asia into my home via Twitter, Facebook, Google Reader and then all the more long-established methods of journalism. It is a cornucopia. But the problem with any over-flowing horn is that it is really only scarcity that creates the awareness of value. And in fact, the profession of journalism is losing both value and respect. The latest Gallup poll showed a record-high 57 percent of Americans saying they had little or no trust in the mass media to do what the media has always proclaimed to be its primary mission – to report fully, accurately and fairly. Instead people look to the friends – their community – for information, for validation, for argument and for illumination. What is great about 2010 is that technology has created a completely new concept of community. And it has given that community new powers to inform and connect. Facebook status updates become a newsfeed created by people I know and even often like. A Twitter feed is a news service of facts, opinions and referrals from an ever-vigilant army of people with similar interests and proclivities. They alert me to news and articles that are almost guaranteed to fit my interests because we are a group that has formed around each other. And it is a self-correcting group, where each of us has the ability to fire, replace and refine the membership at will. No reader selected me to be editor-in-chief of Reuters – I was selected by the corporation to lead the news service in its interest. Conversely, no corporation selected the people whom I follow on Twitter, no board set my blogroll, no executive committee befriended my Facebook pals. I did those things. What technology has done is it has upended the power equation to give control to the end consumer. The beauty of that is obvious – control is always satisfying. The danger is that without care it becomes an information universe that is too hermetically sealed. The days of the all-powerful paternalistic editor may be dead, but what can’t replace them is the era of people only having their preconceived ideas reinforced. What’s needed is a new model, one that combines push and pull. What’s needed is a publishing model that embraces both the professionalism of the journalist and the power of the community. The great press critic A. J. Liebling wrote that freedom of the press belongs to the man who owns one. Today’s technology means that the means of production and the means of distribution actually belong to anyone with access to an internet onramp. If you ask the public, “What will you pay for?” The answer is certainly a yes for tools (ipad, iphone, blackberry, android). The answer is certainly a yes for broadband and access. But what about the content? And what about those who create that content? Far too often the answer is “no”. I know even when I last lived in Hong Kong 15 years ago this was an issue the FCC itself had to wrestle with – what was the ideal ratio of full-time correspondent members to journalist members to associate members to corporate members. I guess from seeing the special promotional offer the club has been running for new correspondent and journalist members that this is still an issue, both because there are fewer people who fit the bill, and also because those who do can’t necessarily PAY the bill. 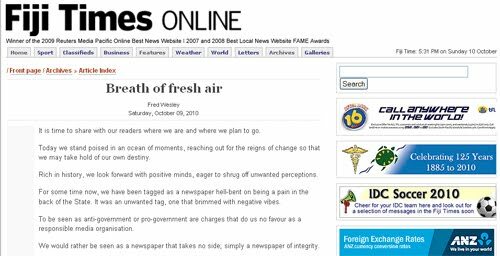 I’m lucky to be leading a journalistic organization 3000 professionals strong – that’s an extraordinary figure at a time when other organisations have been shedding staff. By comparison, in 1987, the year I joined Reuters in Hong Kong and the year I first became a member of this club, I was one of 1581 journalists in the company. We’ve survived and thrived by changing. We aren’t the agency we once were; tomorrow we will be even more different from today. My job is to ensure that survival and to ensure that the journalistic tradition of yesterday melds with the social media ethos. Let’s start by thinking back two years. The photographs of distraught, confused and angry bankers leaving their offices jobless helped symbolise the seismic shifts in the financial system 24 months ago. During the same period, thousands of journalists lost their livelihood too as the profession and craft changed almost beyond recognition. If we have learned anything from these past two years, it has been that pure facts are not enough. Pure facts don’t tell enough of the story; pure facts won’t earn their way. The arguments about whether the factual seeds of the financial crisis had been adequately reported are ultimately meaningless. The facts were there. But they weren’t put together in a way that was compelling enough or powerful enough to change the course of events. We’ve been drowning in facts, and that deluge continues to threaten. How different from October 1851 when Julius Reuter set up his pigeon and telegraph shop, sending out facts to a world starved for them. Today, it’s context, connectedness and community that matter. That’s why the traditional agency or “wire” pouring out a never-ending stream of “more” can’t be the answer. That’s why we must be a service to our customers and to our readers. That’s why this is the age of the publisher. Journalists who understand this will survive. Those that don’t will become irrelevant. A publishing ethos is not defined by the number of stories we deliver. It is defined by our ability to keep our clients tuned in and returning. We will do that with a heightened knowledge of what they need, and with focused breaking news and insight that is fast, relevant, actionable and engaging. Deploying all our multimedia assets allows us to tell stories compellingly via packages of interlinked news and information. And we will enable clients to connect to each other, and to us. I’m as excited about content that gets created in a chatroom by journalists and readers interacting together as I am about a good story being pushed out. Sometimes I’m even more excited because the intelligent interaction between people who all know something about a topic can create a much smarter product than any one writer struggling at the computer alone. Sometimes it is pure journalism. Sometimes it’s commentary. Sometimes it’s just a sharing of ideas or the annotating of a graphic. But whatever you call it, it is an intelligent service between the journalist and the customer and that’s something we should be aiming for. Why? Because like the “pure” journalism of old, it helps makes sense of the world. Why? Because it is news, data, content and information that is actionable because it adds insight to transparency. It’s the community that interacts with information and in that interaction creates yet more and better content. It’s the context and analysis around the news that helps people make better decisions, helps them do their jobs better, and gives them an edge in making sense out of the confusion around us. It is also the humility to know that the old one-way relationship between editor and audience has no place in the world any more. There’s huge learning to be had from the audience. Some of it comes from listening to its expertise. Some of it comes from watching its behavior. Much of it comes from enabling the conversation you get when you combine facts, data, journalism, analysis and fact-based opinion in a really smart way. Knowing the story is not enough. Telling the story is only the beginning. The conversation about the story is as important as the story itself. The more you try to be paternalistic and authoritative, the less people will believe you. The more you embrace new technology as a platform, the more your ideas will compete. The more you look beyond the story for connections, the more value you will have. And if you have value and no one else does, you will get paid. But it is exciting and transforming. 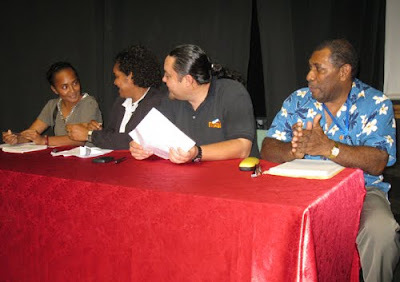 HOW IRONICAL: While a four-day International Federation of Journalists-organised training workshop for media freedom monitors was under way in Apia last week, an intrepid “investigative” journalist from New Zealand was feuding with the Samoan prime minister. 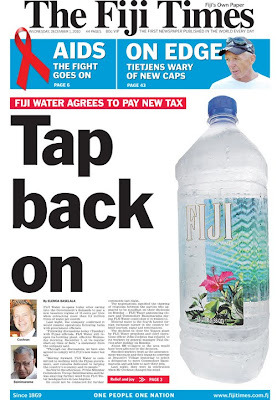 We had a formal agreement [with the PM, reportedly arranged through an Auckland legal go-between]. This is a man who has slagged us off for the past month. He slagged us off on Samoan TV, on TVNZ and on Australian radio – and Australia hasn’t even seen the story. 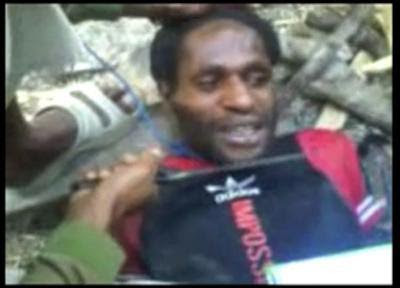 When it comes to the crunch, he is too much of a coward to do an interview – he pulled out at the last moment. 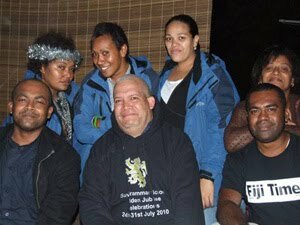 In an Observer editorial, editor-in-chief Savea Sano Malifa branded Campbell “Tuilaepa’s Kiwi nemesis”, explaining the TV journalist’s assignment in Samoa. 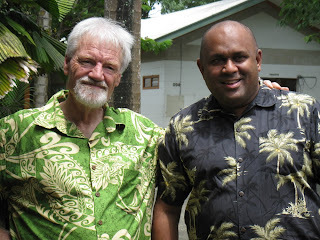 He described the “real mission” as one to find out about how the millions of dollars donated in aid had helped improve the lives of tsunami victims since Campbell Live had reported on the disaster on 29 September 2009. Some 143 people died in the tsunami and 4000 were left homeless. What [Campbell Live] saw shocked and distressed. 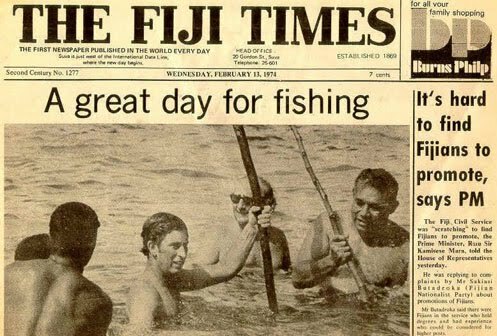 Aleipata was torn apart, people had been killed, others were swept away by the wave and were never found, stories of survival were sad and heart-rending. 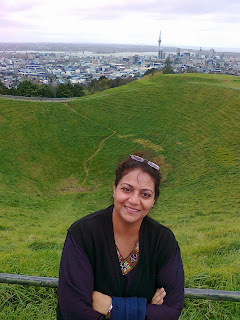 Back home when they returned, they told their story on the screen across New Zealand and people went silent. Soon afterwards, New Zealanders started giving. Moved by Campbell Live's story they donated generously towards helping Aleipata's tsunami victims. However, when John Campbell visited on the tsunami's first anniversary he was disappointed. Aleipata's broken homes along the coastal villages were still there. Some homes had neither running water nor electricity. Village after village, sadness and depression reigned. And so this time, the images and story Campbell Live put on the screen across New Zealand were hardly flattering. Instead, they might have inspired disappointment and even revulsion. 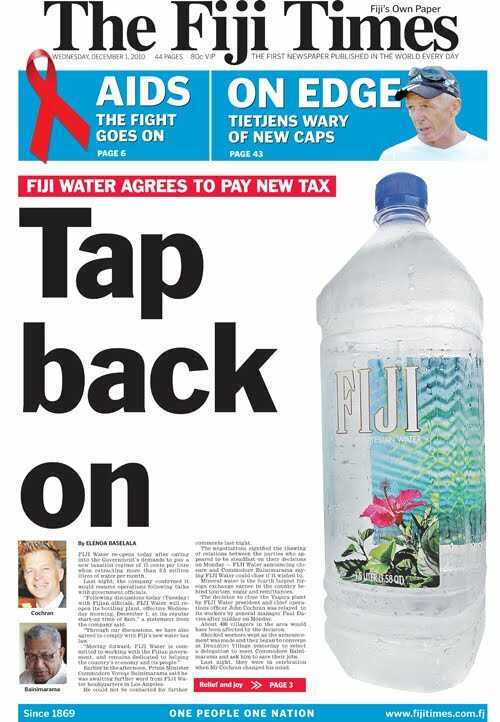 He even suggested that "up to $US45 million in aid had been misappropriated, while many tsunami victims are left without water or electricity". However, this was a very different story from Pacific Scoop's Alex Perrottet who recently did a compelling series on aid and development in Samoa. 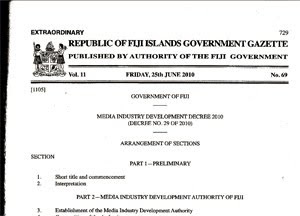 Tuilaepa retaliated by branding the Campbell Live report as "stupid and uninformed" in a Radio Australia Pacific Beat item. He told interviewer Geraldine Coutts the claims were "all ridiculous and based on the report by this amateur reporter, Mr Campbell, who came here and spent all his time talking to the Observer newspaper - and then, in his own words, spent much time on the coast. People have moved inland, and therefore he could not have seen what has taken place." Talamua also carried a story describing the Campbell report as "sensational" based on very few interviews and information. 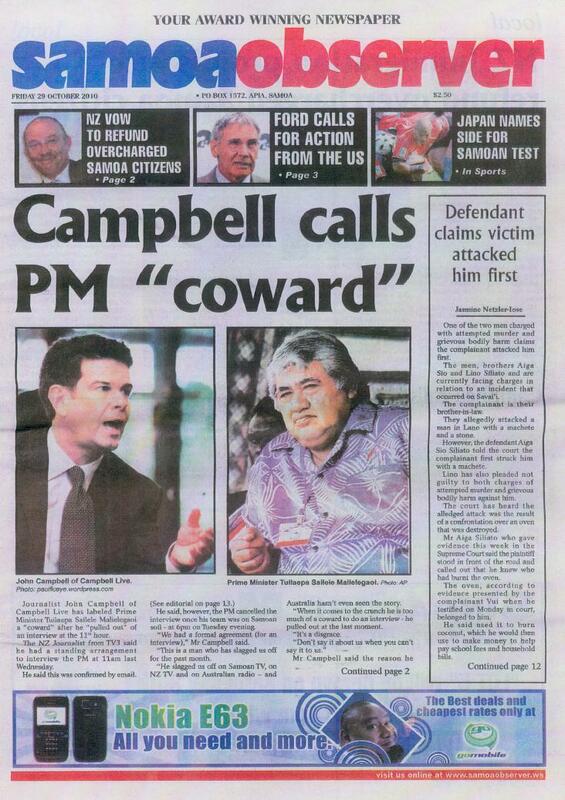 For many of the Pacific journalists who watched and discussed the Campbell Live report during an ethics and democracy workshop at the conference, the item was stunning for its crassness, cultural arrogance and ignorance and lack of evidence underpinning the sweeping allegations. 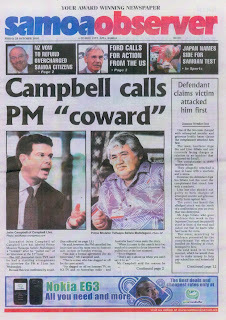 No doubt there is a story there, but Campbell Live hasn’t yet exposed it. In New Zealand, the government would be compelled to answer it – and would do the same as a matter of course. Yes, there are new roads and electricity is back in the region. The Samoan government says it has spent 68.74 million tala so far, but many tsunami victims feel deserted by their government and wonder why so little of the money has made its way back to them. Documents obtained by Campbell Live suggest many millions more dollars have been received than have been spent around the coastline. Nevertheless Café Pacific reckons the “investigation’ will need a lot more hard facts and evidence to get anywhere. Last word - from a blogger who, while acknowledging the money trail is worth following, dismissed the original report as a “shocking abuse of his viewers”. 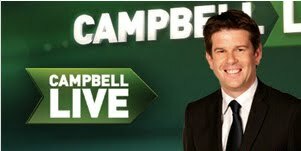 [Campbell] knows that most of his viewers in their cosy western houses in New Zealand will compare this shack to what is normal in New Zealand. 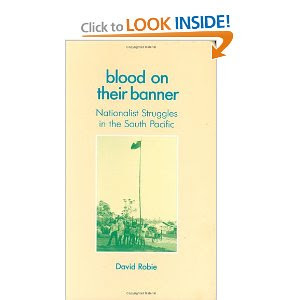 Now, I have been to Samoa – I have seen normal Samoan villages, where people live in fales. There are no toilets, bathrooms, kitchens, windows made of glass [and] water pipes. We are talking about Samoa here – a Third World country. It is normal in Samoa to have none of these things. In Samoa, if you have these things, you are rich. 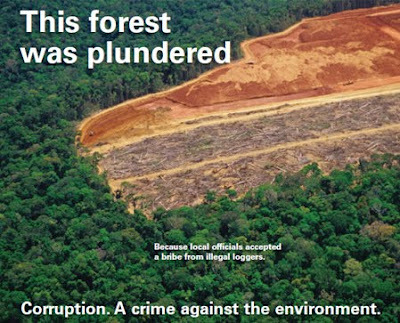 Campbell video link (Nov 1) - Where has the tsunami money gone? Campbell video link (Sept 27) - Samoan tsunami: Has aid been used effectively?